More than 20 people with learning disabilities and their supporters came to learn about recording their life stories at Canterbury Christ Church University’s Broadstairs Campus on a wonderfully sunny day in March. The workshop was led by Jan Walmsley and Sue Ledger, members of the Open University’s Social History of Learning Disabilities Research Group. People came from all over East Kent, from Folkestone to Canterbury, Dover to Margate. On arrival, everyone looked at examples of life stories by people with learning disabilities, going back as far as Joey Deacon’s back in the 1970s. And met Joyce Marsh, who, with the help of Mencap volunteer Linda Smith, actually published her life story in 2015. It was inspiring to everyone to meet someone who had actually done it. We then viewed a film, No Longer Shut Up, which tells the life story of the late Mabel Cooper. Mabel was taken into Children’s Homes, and later into a huge institution in Surrey called St Lawrence’s. After she left St Lawrence’s she campaigned for the rights of people with learning disabilities, and told her life story wherever she could so that people are ‘No Longer Shut Up’. No one in the audience had lived in a long stay hospital, thankfully, but most people could relate to Mabel’s story – being moved around, being bullied, not having a say in your life, these experiences were shared by many of the people who came. We then got around to discussing how many people wanted to tell their stories. Everyone did. Lots of people shared bits of their lives to explain why it was important that their stories are recorded. After an excellent lunch we thought about the practicalities, how people actually tell their stories. Joyce and Linda explained that they had had lots of conversations which Linda had written down. That is how they made their book. We watched videos of interviews, and thought about what makes a good interview. Everyone then practised asking and responding to questions. Some people were quite brilliant at doing this. We talked about ethics – making sure people know what they are agreeing to; rules about using photos which show people; and thinking about other people whose stories are part of our own lives. Do they have a say in what people record? Finally, we got around to discussing what to do next. Make a book of people’s lives like Joyce Marsh? 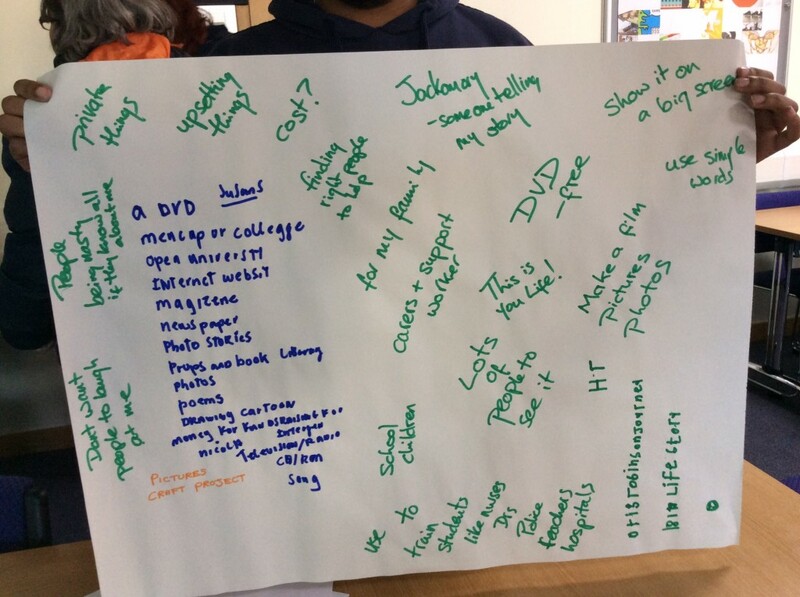 Other people liked the idea of making a film about the lives of people with learning disabilities in East Kent. Everyone agreed that these life stories need to be on a website and that professionals need to know about people’s past, as well as their present, and to learn what makes for a good life – and how they can help. East Kent Mencap, East Kent NHS Hospitals Trust and Canterbury Christ Church University, who sponsored the workshop, are now discussing how to raise money to make the dream of recording the lives of people with learning disabilities in East Kent a reality. This entry was posted in Info, Reflections, Reports and tagged Canterbury Christ Church University, East Kent Mencap, East Kent NHS Hospitals Trust, film, ideas, jan walmsley, learning disability, people with learning disabilities, recording life stories, sue ledger, workshop by admin. Bookmark the permalink.